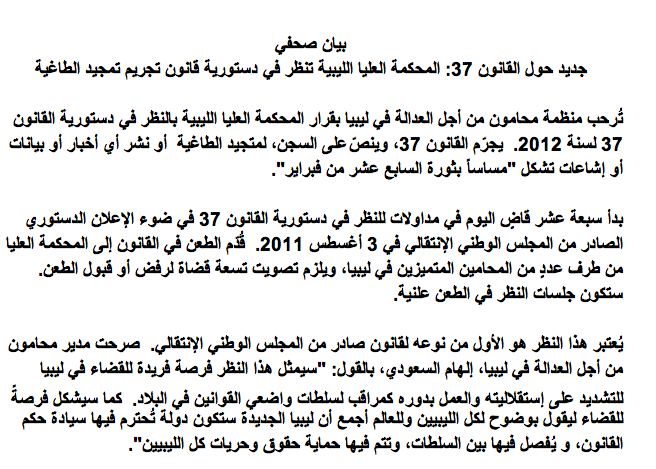 Lawyers for Justice in Libya (LFJL) welcomes the Supreme Court of Libya’s decision to review the constitutionality of Law 37 of 2012. Law 37 criminalises and provides prison sentences for the glorification of the dictator as well as the publishing of any news, propaganda or rumours which “harm the 17 February revolution”. Today seventeen Supreme Court Justices have begun hearings to review Law 37’s constitutionality in light of the National Transitional Council’s (NTC) Constitutional Declaration of 3 August 2011. The challenge to the law was submitted to the Supreme Court of Libya by several distinguished Libyan lawyers. Nine judges will be needed to either reject or approve the law. The review will be conducted in a public hearing. This is the first judicial review of a law passed by the NTC. “This marks a unique opportunity for the judiciary in Libya to assert its independence and act in its capacity as a monitor of the powers of the lawmakers in the country. This is an opportunity for the judiciary to state clearly to all Libyans and to the world at large that the new Libya will be one where the rule of law is upheld, the separation of power is enforced and Libyans’ rights and freedoms are protected,” said LFJL Director, Elham Saudi.